Distribution: The alewife is found in Atlantic coastal rivers from Labrador to South Carolina. It has been introduced into a number of inland waterbodies. Description: The alewife is a silvery colored fish with a grayish-green back, large scales, and a deep, laterally compressed body. The belly scales converge into a sharp edge, which gives it the nickname “sawbelly.” The alewife may be distinguished from blueback herring by its larger eye, which is wider than the distance from the front of the eye to the tip of the snout. The two species also differ in the inner lining of the abdominal cavity or peritoneum, which is white in the alewife and black or dark gray in the blueback herring. The lower jaw of the alewife has an indented, or shovel shaped appearance, while the American shad has a straight lower jaw. Alewives (right) tend to be larger and deeper bodied than blueback herring (left). Habitat: Lakes, ponds, freshwater rivers, estuaries, and coastal habitats. 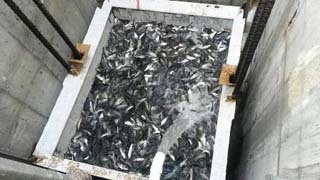 Life History: Alewives are members of the herring family. As with all members of the herring family, alewives spend the majority of their lives in the ocean. In the spring, adult alewives move into freshwater, migrating up coastal rivers from North Carolina to Newfoundland. Alewives spawn in lakes, ponds, and slow flowing backwaters of rivers. Juvenile alewives migrate downstream to the ocean in late summer and fall, where they will remain until sexual maturity in 3 to 5 years. The inner lining of the alewife’s abdominal cavity is clear or white in color. Conservation/Management: Alewife numbers have declined significantly throughout their range. Commercial landings of river herring, a collective term for alewives and blueback herring, have declined by 95% since 1950. At normal population levels, alewives are a source of prey for a wide range of species from harbor seals in estuaries to chain pickerel in lakes and ponds. The New Hampshire Fish and Game Department is working to restore river herring to coastal rivers and the Merrimack River watershed. Fish ladders are monitored at the first dams on the major tributaries of Great Bay, including the Cocheco, Oyster, and Lamprey Rivers. However, much of the former spawning habitat of river herring remains inaccessible in New Hampshire. Dam removals are the best long term strategy for restoring river herring runs. The removal of the Great Dam in Exeter improved access for river herring to over 7 miles of potential spawning habitat in the lower Exeter River. In May, fish can be seen swimming up the ledges where the old dam once stood as they run a gauntlet of sea gulls, cormorants, and other predators. The Merrimack River alewife population has been severely depleted. Historic spawning runs, which likely numbered in the millions, had been reduced to the low thousands by the year 2010. The New Hampshire Fish and Game Department is working with partners like the U. S. Fish and Wildlife Service and the Massachusetts Fish and Wildlife Division to restore river herring numbers in the Merrimack River. Strategies include stocking adult river herring into suitable habitat within the Merrimack River watershed. Initially these fish were transferred from other rivers including the Kennebec, Androscoggin, Lamprey, and Cocheco Rivers. As runs began to increase in 2015, more fish were stocked from the Merrimack River. Fish are collected from fishways at dams and loaded onto stocking trucks. The largest of the stocking sites is Lake Winnisquam, which has the potential to produce millions of juvenile river herring each year. In 2018, the number of river herring counted at the Essex Dam on the Merrimack River in Lawrence, MA set a new record of 449,356 fish. The ultimate success of the restoration program will depend on improvements in fish passage, which will allow river herring to reach as much suitable spawning habitat as possible. Fish passage is currently available at the first three dams on the mainstem of the Merrimack River (the Essex Dam in Lawrence, MA, the Pawtucket Dam in Lowell, MA, and the Amoskeag Dam in Manchester, NH) and at the first two dams on the Nashua River. The long-term goal of a self-sustaining river herring population in the Merrimack River will depend largely on the efficiency of these existing fishways and on the construction of new fishways at dams throughout the upper Merrimack River watershed, including tributaries like the Suncook River, the Soucook River, and the Contoocook River. The New Hampshire Fish and Game Shad Truck is used to transport alewives into spawning habitat that is currently inaccessible. Thousands of alewives fill the fish lift at the Essex Dam in Lawrence, MA. Photo was taken during the peak of the River Herring run in May. Monitor existing fish passage facilities. Improve fish passage with new fishway construction and dam removals to provide access to suitable spawning habitat. Work with partners to monitor commercial bycatch and make recommendations that will increase stocks of river herring in the ocean. Continue to implement the Merrimack River Herring Restoration Plan.